Editor’s Note: Dan O’Connell has been producing excellent multi-part posts on some of the lesser known campaigns of the Civil War over at TOCWOC – A Civil War in his Campaign Series. I’ve taken this series on the First Battle of Deep Bottom, and with Dan’s permission, I’ve posted it here in its entirety. Dan’s specialty is engineering operations during the Civil War, and I think you’ll find his writing informative and engaging. Kershaw responding to Lee’s call for aggressive action increased the pressure on the Union bridgehead. As a result the opposing sides conducted a series of back and forth forays for control of the batteries and road network. On the 25th a position gained and held by the 11th Maine was turned over to two regiments of Col. Leonard Currie’s Brigade. The pickets from the 162nd New York were attacked and called for reinforcement. The remainder of the regiment went up to strengthen the line but “fell into an ambuscade” and were driven back into the works surrounding the pontoon bridge. Foster was disgusted with the effort and accused Currie’s men of “shameful conduct.” Foster, at the suggestion of his staff engineer, requested sand bags and pick axes to fortify his line. 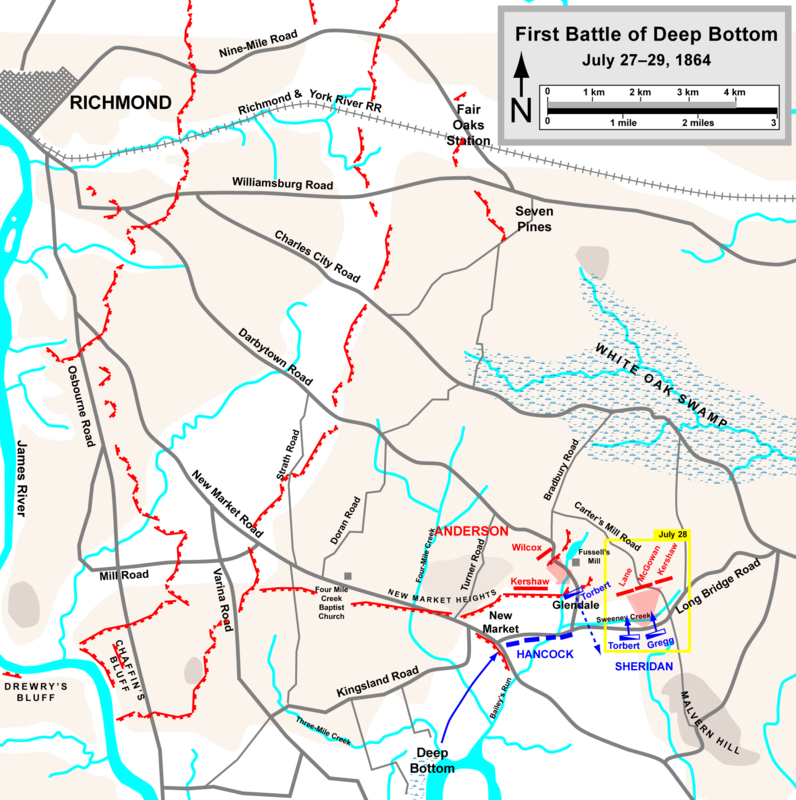 The entire compliment of Federal troops was called into the trenches in anticipation of a general attack. What was heard were preparations by the Confederates to regain the lost territory. Artillery was moved into the Confederate line, so close to the Union pickets that “a single discharge of grape from the battery could sweep them away like chaff.” Believing that they could not successfully resist the coming attack the troops were recalled to the other side of the creek. Two days of close quarters fighting cost Plaisted 23 casualties. Confederate losses were reported by Plaisted at 108. While Foster conducted his isolated fight to preserve the bridgehead Hancock began his move. His orders were to cross the Appomattox at dark and proceed to Deep Bottom. After crossing that river he was to travel by side roads “so that the cavalry, which was crossing at Broadway Landing, might have an unobstructed road to Deep Bottom. “ The difficult passage down the unknown road in the dark was eased by General Butler who arranged to have the way lit by small fires placed at convenient intervals. Arriving at the James, Hancock met with Sheridan and Foster. During the meeting Hancock briefed what he understood of his role in the operation. He was to take positions near Chaffin’s Bluff and prevent the Confederates from crossing troops to the north side of the river. This clearly was at odds with Grant’s commander’s intent to draw the Confederates in that direction to weaken the force in front of Burnside. Hancock went on to state that all other moves on his part were dependent on Sheridan’s actions. Again this seemed in contrast to Grant’s concept that had Hancock holding open the way by engaging the enemy west of Sheridan’s axis of advance. The march to the lower bridge consumed the remainder of the night. It was not until 7:25 a.m. that Hancock could report his last brigade was crossing the bridge. 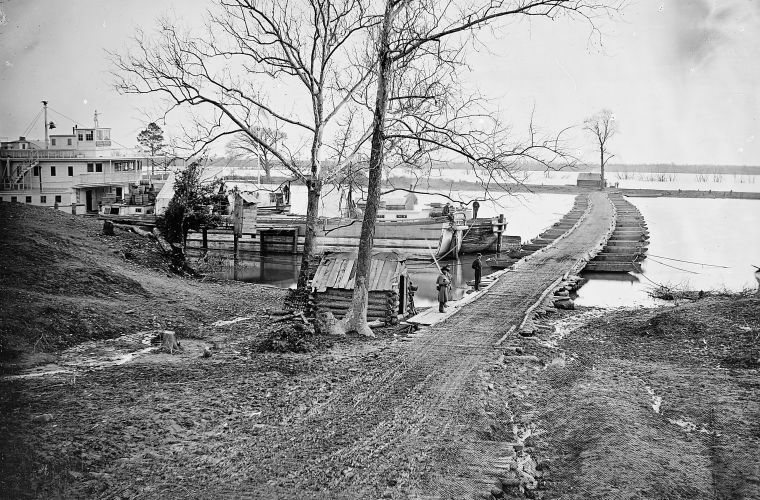 Hancock, who announced that he did not use the upper crossing partly because it would cause the operation to “lose the character of surprise” had given the Confederates extra time to fortify their defense at the creek.